While Muhammad was alive, he chose 4 of his closest sahabas and entrusted the recitation of the Quran to them. Muhammad commanded all his followers to learn the Quran from them. Years after Muhammad died, Abu Bakr, the first caliph decided to compile the Quran, fearing it would be lost. Did Abu Bakr consult any one of the 4 men that Muhammad personally chose? NO. Abu Bakr instructed Zaid Ibn Thabit, who was a scribe, to do the job. Did Zaid consult or request help from any one of the 4 men that Muhammad chose? NO. Were the 4 great early quran teachers UPSET that they were ignored and rejected? YES! They were FURIOUS! They already had their own Quran codices. After Zaid ibn Thabit finished compiling the first official Quran without input from the four…. By the time the 3rd caliph, Uthman, came to power, there were many versions floating around. The books of the 4 great teachers and other hafiz had spread throughout the empire and used widely and gained popularity. Due to this confusion, the 3rd Caliph Uthman instructed Zaid ibn Thabit to EDIT his Quran again, which he had compiled years earlier under Abu Bakr. The purpose was to come up with a standard and final official version for correct recitation. Once that was done, Uthman ordered the burning of the rest of the versions including those of the 4 great teachers personally hand-picked by Muhammad. Sadly, Muhammad was no longer around to disapprove of the situation. Abdulla Ibn Masud gave a passionate speech as Uthman’s henchmen were burning his Quran, tearfully declaring that he knew the Quran better than anyone else.. Authors note: The more I read about the sahaba, Ibn Masud, the more I am convinced that it was his Quran that was the true and genuine one. Unfortunately, this Quran is no longer in existence today. Thanks to Uthman. Is There Science In The Quran? Why Did Uthman Burn Early Quran Manuscripts? 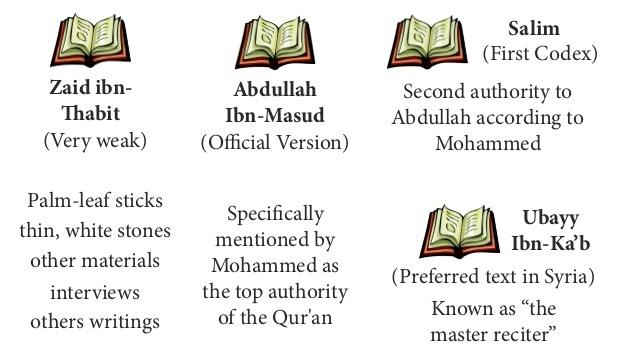 What Version Is Your Quran? Do Old Quran Manuscripts Match The Quran? What Came First – Bible or Quran? Who Says The Quran Is Incomplete & Imperfect? Is The Quran Perfectly Preserved?